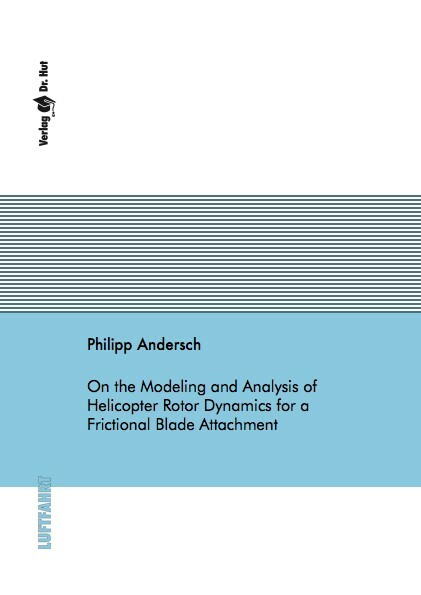 Due to potential instability, the coupled rotor-fuselage dynamics of helicopters have to be thoroughly analyzed and predictive simulation models are of great importance. As part of this thesis, an established design for which friction contributes to system damping is investigated and approaches for modeling and analysis are developed. Thus, predictive dynamical analysis capability is extended to rotor-fuselage designs featuring stick-slip friction. Aufgrund möglicher Instabilitäten ist die modellbasierte Bewertung der Dynamik eines gekoppelten Hubschrauber Rotor-Zelle Systems von großer Bedeutung. In dieser Arbeit wird ein etabliertes Rotorsystem betrachtet, bei dem ein Teil der notwendigen Dämpfung durch Reibung erzeugt wird. Die dafür entwickelten Methoden zur Modellierung und Analyse ermöglichen die prädikative dynamische Untersuchung von Rotor-Zelle Systemen mit Haftreibung.